ENCINITAS, Calif. -- Talking about "going green" is easy. Actually being green isn't. But for members of a north San Diego County gym, shrinking their carbon footprint is as simple as riding a bike. "It's pretty fantastic when you can just hop on a bike and send power back to the grid," said patron Kris Rivers. The Encinitas-based Greenasium gym has all the typical fitness fare, from free weights to circuit training. But riding a bike that helps power the electric grid is just a small piece of the eco-friendly puzzle. 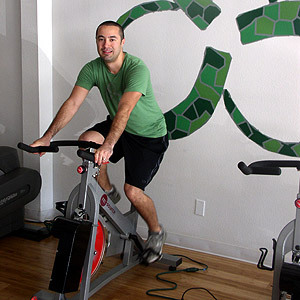 Kyle Kensing Co-owner Byron Spratt rides one of the Greenasium's stationary bikes. The bikes are hooked up to a generator and send power back to the grid. The usual means of green came into play as Byron Spratt and his partners prepared for a Sept. 1 grand opening. For example, patrons are asked to bring their own reusable water bottles and towels. There isn't a paper towel or Styrofoam cup in sight. The gym itself is put together from reused materials. "The front desk, these [reception area] benches are made from lumber that the last tenants left," Spratt said. "This carpet is recycled from plastic. The dumbbells [are] pre-owned, but you wouldn't know. They look no different than brand-new." Nothing at the Greenasium goes to waste. And nothing means nothing -- not even the energy patrons expend. The gym's stationary bikes are connected to a generator that turns human power into electricity . Beyond that, the gym uses natural lighting and incurs few energy costs. there are fluorescent lights running all day," Spratt said. "Of course the sun isn't always going to be out. With fall and daylight saving time ending it's going to be dark much earlier so we'll have to run on the lights more." And that's when the energy-generating bikes come into play. A single, average workout can generate in the neighborhood of 300 watts of electricity. There are three bikes lining a wall with a generator no larger than a car battery. On a warm day, they power the gym's fans and in dark months cut down on energy usage. "The bikes are just part of what we do overall," Spratt said. For customers like Rivers, the overall eco-friendly attitude is a means of taking care of two desires in one fell swoop: getting in a workout, and doing her part for the local environment. "Today for example," Rivers said, "I took over a grocery sack full of recyclables, old cell phones and batteries I had lying around because [the Greenasium had] an electronics recycling drive going." Spratt said, "it's the little things, the little choices," that make an environmental impact, so something as simple as a recycling drive can go a long way. It's also a means of standing out among the competition. The Greenasium is located close enough to a national fitness chain to see it from the parking lot. But that daily reminder helps the Greenasium owners to look for alternative ways to get the word out. Since marketing through traditional avenues like windshield fliers contradicts the Greenasium's whole message, Spratt signed up human power to get out the word. "Instead of having a tent at the Encinitas Oktoberfest [a local street fair], we volunteered to put up and take down tents for other businesses," he said. The team also takes its mission to the community. Recently, it organized a group to clean up nearby Moonlight State Beach. "I have a daughter I want to be able to leave a good environment to for her kids, and their kids and even further on down the line," co-owner Alex Spratt said. Simple as riding a bike. Kyle Kensing is a freelance writer for Sports Media Exchange, a national freelance writing network.